Home / purdy brushes box sets / purdy roller refill. purdy white dove 6 pack 4.5 refills. 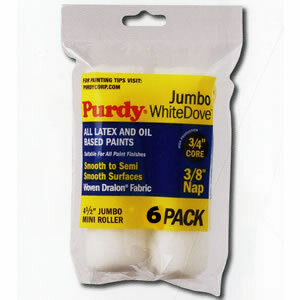 Product Code: PURDY WHITE DOVE 6 PACK 4.5 REFILLS. PURDY 6 PACK OF WHITE DOVE ROLLER REFILLS. 4.5 INCH ROLLERS WITH A 3/8 NAP. A GREAT QUALITY PRODUCT WHICH ENABLES YOU TO GIVE YOU A PROFESSIONAL FINISH.